natural dyed textiles like indigo, ebony, lac, mudding, persimmon/ Hill tribe textiles/Lithuanian linen in many places. Assist my husband Teppei Ono, ceramic artist, with his wood fired kiln. Sow a field with seeds and plant trees. Travels around Asia with family looking for Asian textiles. Holds exhibitions with Seturo-san once in a while. 1983 Traveled around Asian countries and met Asian hand spun and woven textiles. 1983 Met the life of Thai farming village, Hill tribes, poet and painters of ""art for life movement."" 1985 Started a life in a small mountain in Tokoname, Aichi prefecture with Teppei. 1985 Plowed a small field and raised children. 1986 Exhibition ""Tanebitotachi no Yumemirutokoro""(Dreams of Sowers) in Genkai Gallery, Tokyo. 1988 in Silpakorn University and Chiang Mai, Thailand. 1989 Traveled to India and Nepal with family. 1994 Creation at Dan Kwian, a town in Thailand. 1998 Moved to a mountain top of Kouchi. Made a small farm and orchard in a rice terrace. Met Taniai sowers. 1999 Exhibition ""Tanemakibito no Kirufukutachi""(Clothing for Sowers) in Nanohana, Odawara. 2001 in Gallery Cinquieme, Matsuyama. 2005 Exhibition ""Tsuchi ga Aru. Nuno ga Aru."" (Soil and Textile) in Umeya, Fukuoka. 2008 Exhibition ""Tsuchi ni Ikiru. Nuno to Kurasu. ""(Live with Soil and Textile) in Tsukikusa, Nara. 2008 Published first essay book, ""Tanemaki Note""(Sower's Note). 2009 Toured around Japan for the book ""Tanemaki Note""(Sower's Note). 2010 Traveled to Varanasi, India. Published ""Tanemakibito no Monotsukuri""(Sower's Creation). 2011 Toured around Japan for the book ""Tanemakibito no Monotsukuri""(Sower's Creation). 2011 Traveled to Dharamsala, India. Published ""Tanemakibito no Daidokoro""(Sower's Kitchen). 2012 Traveled to Bhutan, Myanmar, Taiwan, and Okinawa. 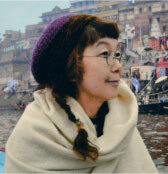 2013 Published""Tabisuru Tanemakibito""(Journey of Sowers). 2013 Traveled to Republic of Madagascar to meet Baobab tree. 2013 Listened to Dalai Lama's lecture "How to free the world." 2014 Exhibition tour in Okinawa.